Indian High Commission (IHC) is trying to simplify its immigration system. This is because India is taking giant strides towards fostering international education and trade. A better organized Indian visa application process is the next step in this direction, and so if you are planning to do an internship abroad as international student, the time is ripe to apply for an Indian visa. 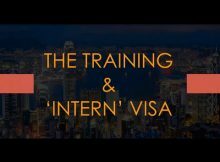 What is an Intern visa? Prior to April 1, 2017, it was necessary for foreigners to obtain an Employment visa or a Business visa (depending on case-by-case reviews) for pursuing internship programs in India, and the overall process was complex. The procedure has been simplified now and foreigners who meet certain conditions can now get an internship visa. Intern visa is the new addition to the group of Indian visas, introduced for foreigners intending to pursue internships in Indian companies, educational institutions, and NGOs. The period of Intern visa would be restricted to the duration of the internship program or one year, whichever is less. The intern visa will be granted after completion of graduation/post-graduation. The gap between the completion of graduation/post-graduation and the commencement of the internship should not exceed one year. Conversion/extension of the Intern visa into Employment visa or any other type of visa will not be permitted. If the internship duration is more than 180 days, the intern is required to register with the concerned Foreigner’s Registration Office (FRO) within 14 days of arrival. Earnings of the foreign nationals from the internship will be subject to the Indian income tax regulations. The intern can have single/double/multiple entries in India during the mentioned time. If the internship is in a company, the intern should draw a minimum remuneration of INR 7.80 lakhs per annum to be eligible for this visa. Online application: You need to apply online and fill the Indian visa application form. A letter from the concerned Indian company/educational institution/NGO sponsoring you for the internship program, clearly indicating the period of internship. Once your application is submitted successfully, submit the physical copy of the application form, along with your passport, at the concerned Indian Visa Application Center (IVAC) (or directly to Indian Mission/Post in absence of IVAC) on the scheduled date of interview along with the requisite supporting documents. For further details and to check the status of your application, visit here. Indian visa fees depend on different factors and you will get to know the exact amount during the online application process. Upon receipt of the visa application through IVAC or directly, the Indian Mission/Post requires a minimum of three working days to process the case and issue a visa depending on the nationality. Photo requirements: You need to upload your digital photograph to complete the regular visa application and there are specific guidelines for that. You can check them here under ‘Photo Requirements’. If you have been employed even for a short period of time, if you are still studying in college, or if you won’t be starting your internship within one year of graduation, you are not eligible to apply for the Intern visa. You need to continue applying under the Business/Employment category. Some countries like Russia, Egypt, and Spain etc. haven’t adopted the Intern visa yet. If your country is one of them or if the company is providing you a remuneration less than INR 7.80 lakhs per annum, you’ll need to apply for the Business visa or Employment visa only.